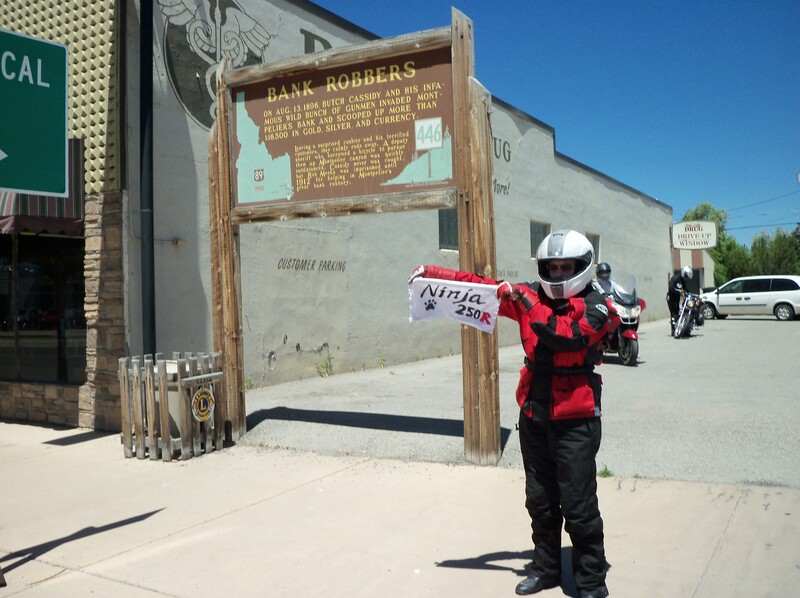 2012 Utah 1088, Part 3: Rally Day! Experience a different time management challenge – some say that 12 hours is harder than 24 because you don’t have as much room to compensate for errors. Avoid the critters – one veteran of several multi-day rallies has tangled with a deer and decided she didn’t want to deal with that on this rally. I agree. Avoidance of night riding – bad eyes, lack of supplemental lighting, fear of critters – all valid reasons not to ride at night. More relaxing – some veterans are warming up for the MERA 10-day rally later this summer and just wanted to relax on this year’s Utah 1088. This year there were 12 entrants, 10 finishers, and most of my competitors had considerable rally experience, including multi-day rallies – a very different picture from 2011. Last year, I showed up with the goal of finishing and ended up winning (sort of by default). This year, I obviously had some interest in defending my title, but with the added numbers and level of competition, I quickly went back to my original goal: Be A Finisher, not a DNF. At the start line, I had two options for my first bonus: head east to the BMW shop on the northeast edge of downtown to pick up a signed business card, or head west and south to the firing range for the shooting bonus. Strategically, the choice was pretty much a wash, so I decided to make the tactical choice as I left the parking lot after seeing which direction the other riders chose. You see, both had the potential for traffic jams and waiting in line. Most of the riders turned left out of the parking lot (toward the range) so I turned right. I made a quick jaunt out to the Bavarian Motorcycle Workshop just north of the city. As I passed by the I-80/I-15 interchange, the cops and construction crews were just starting to shut down eastbound 80 at I-15 and divert everyone onto I-15. That worked out nicely, I’m guessing there might have been some traffic back-up had I hit this interchange later. Just a couple of other riders at the parking lot of the shop – got my signed business card and stowed it safely in my neck bag, noted my time and mileage, and bagged my first 1756 points. Then I committed my first illegal act of the ride – crossed over a gravel median without a moment’s hesitation so I could head back the way I came. Yep, not my first rodeo, I landed at the bottom of that slippery slope last year. Next up, the shooting range. This bonus involves standing in line at a firing range, paying a fee, and taking three shots at a target. At the end of the rally, the best shot wins the gun. I skipped it last year because the duration was out of my control and it wasn’t worth enough points. This year, the Rally Master increased the points and boosted it to the must-do “red” category. I also learned that the actual shooting was optional if you were philosophically opposed or just didn’t care about winning the gun – the only requirement was to stand in line and pay the fee. My start line gamble paid off – by the time I arrived at the range, there were only 5 riders ahead of me in line and I was way ahead of schedule. I waited my turn, paid my money, declined to shoot, and was back on the road at 7:36am with 7806 additional points under my belt. I headed west to Magna for a visit to the Pleasant Green Cemetery. 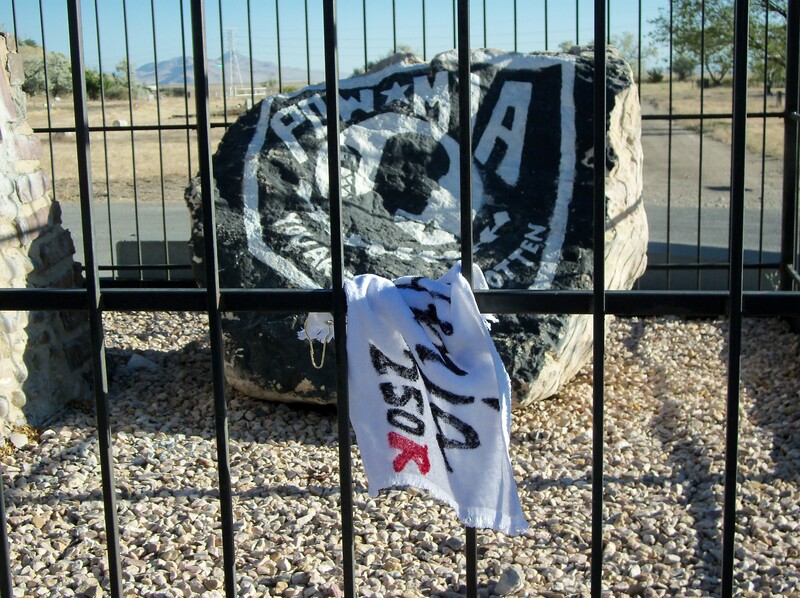 My task was to take a photo of the POW/MIA rock, which was reported to be enclosed in a fence in the middle of the cemetery. Cemetery bonuses can be tricky (as I learned in my warm-up rides) because you can never be sure if you’ll be able to drive to the target of if you’ll have to park the bike and wander around to find it. For this reason, I had allowed 20 min in my S&T planning for this one. Lo and behold, I could see the fenced area when I crested the hill at the entrance and drove right to it. Park, place the towel, snap the shot, note the time and mileage (a recurring theme), and I’m back on the road. This is the point at which I diverged from the Rally Master’s directions. Rather than heading south (toward the wild fire and some known construction areas), I got onto USH-210 and headed east toward I-80. My next task was to preempt that second-half bonus I mentioned earlier. I was looking for a golf cart crossing bridge on USH-65 near I-80, and I had to report how high the clearance was. 15’ 3”, 569 points. BTW, I wasn’t the only one that decided this was the more efficient route – I encountered at least two rally bikes in the couples class while I was there. The next stop was a GPS-only bonus. We were told to go to “N 40 42.974 W 111 17987” and take a picture of the unusual Diner that stood in that spot. As it turned out, this was right on my route and based on the description, I could have gotten the photo without a GPS. But remember I told you that we had to declare out GPS and submit the serial number during the check-in process? Something tells me that you wouldn’t be successful trying to claim the points for the GPS-only bonus if you hadn’t reported your GPS. I had, I took the photo, and I got 2917 points to show for it. After that, because I had decided to short-cut the suggested (and reportedly beautiful) base route on USH-150, all I had left to do was get to I-80 and complete the long boring 45 mile ride to the CP in Evanston WY. Along the way, my GPS said that I was going to get there an hour early, and I found myself wondering if I could pick up another second-half bonus during that “break”. My next bonus was at MP-19 on WSH-19, just east of Evanston heading toward Kemmerer. Not knowing where MP-19 was, I decided to head out there and hope that it was near the I-80 end. That would save me a little time after the CP. When I was done with my housekeeping, I headed across the parking lot to where the rally staff was gathered and took out the laminated placard I had been given with my route instructions. The CP requirement was to have the Rally Master take a photo of me holding the placard. At 10:55am (the CP didn’t open until 11am), I sat there like an idiot holding my placard with my bike running and my helmet flipped up. He finally acquiesced and took my photo early, but reminded me that I couldn’t leave until 11am. Yep, I know that. My long-time friend and rally-staffer Bill Gillespie stood next to me holding his cell phone (which reflected “official rally time”) and counted down the minutes before I could leave. At promptly 11:00am, I popped the clutch and headed east. This time I wasn’t the least bit surprised by the winds on I-80 because, after all, I had been there before and I was ready for it. I also knew that I had 19 miles on WSH-189 before I had to worry about my next bonus. Maybe that little detour paid off in reconnaissance data. MP-19, WSH-189 – What’s the name of the creek? I don’t even remember now – was it Arthur? Arnold? Regardless, I wrote it down (along with my time and mileage) and moved on toward Kemmerer with 635 more points. As I pulled up at the store, a friend (let’s call him Larry) offered to take my picture with my rally towel and the store in background (meeting the bonus requirement). How nice! He then related this story: he had just found another rallyist’s paperwork that was left behind – this is a big deal, without paperwork, there are no points. He called the Rally Master for guidance and was told to leave it somewhere obvious and secure in case the rider came back. Good on Larry for sportsmanship points! 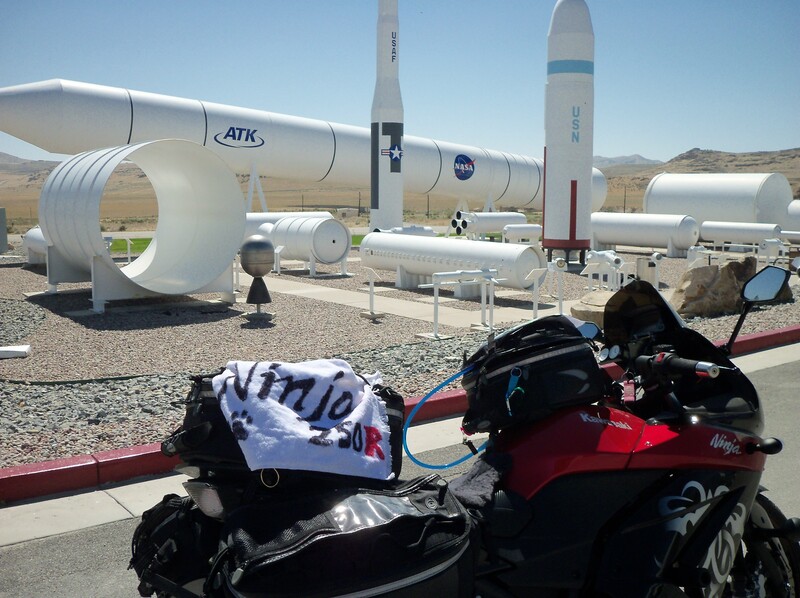 As I was getting ready to ride off, I discovered a rally towel sitting on my saddle bag. For a moment I chastised myself for not putting mine away (because without a rally towel, there are no points either), but then I discovered it wasn’t mine, it actually belonged to Larry – he had set it down while he was taking my picture. I chased him down across the parking lot and returned it. As I was leaving town, I realized that Larry’s generous offer and subsequent towel mishap had thrown off my precious 3-part rhythm (bonus requirement, time, mileage – remember that?) and I had neglected to record the latter two data points. I pulled over and (yes, I’ll admit it) retrofitted the time and mileage. It was only a mile and a minute – honest, I was there when I said I was. Later we learned that the original paperwork-loser showed up at the CP in Evanston (he was on the 24-hr ride, which came from the north and had a different CP window) and was prompted repeatedly by helpful rally staff “Where’s Your Paperwork?” He was doing his own CP routine so he balked and resisted and got annoyed, but they persisted. 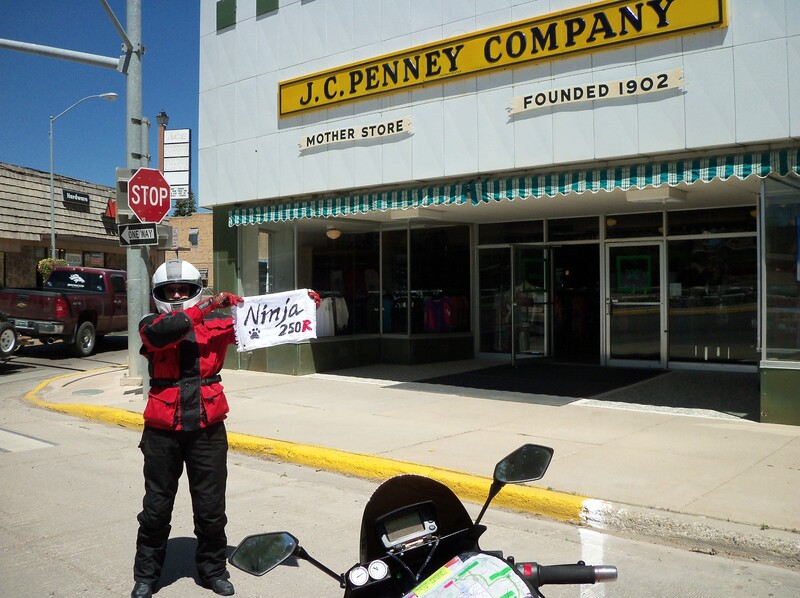 When he finally realized what they were trying to tell him, he was informed that he could find it in Kemmerer, so he went to retrieve it (about 90 miles round-trip) and still made it back to the CP in time. When I showed up in Montpelier ID for the next bonus, another rally participant (this time a pillion rider in the couples class) beckoned me into a parking spot on the curb, gestured Vanna White-style toward the sign we were to photograph, and again offered to photograph me and my rally towel with the sign. This time, based on my near-mistake in Kemmerer, I was more vigilant and remembered to complete the rest of the requirements (time, mileage) before I rode off with 756 more points. After a fuel stop in Montpelier (with a full checklist review), I was faced with a long boring ride up USH-30 from Montpelier through Soda Springs to I-15. Until this point, I had been encountering rallyists at various points along the way – those who had chosen the same shortcut, and then at the three bonus stops after the CP. But I knew that I would be diverging from the pack at Montpelier and would be on my own because most (in fact all) of the other riders would be heading south on USH-89 to Bear Lake. In the interest of full disclosure, I also have to admit that I didn’t fully review the question in Montpelier and on the boring multi-mile stretch that followed, I found myself with these thoughts running through my mind: “Was that really the right sign? Why did I believe them? Did they just f@*# me up deliberately? Did they lead me down a garden path of rally FAIL? Nah, they’re in a different class (the couples class), they’re not competing against me. And besides, they’re Canadian – they aren’t that devious… right?” Yes, I shared my paranoid reflections at the bar after the event and the three of us had a good laugh. I also had plenty of time on that boring leg to second-guess my round-about routing decision. But I remained confident because I had done so well to that point (or so I thought) and I knew that because of my earlier shortcuts, I needed the high-efficiency miles that I would get on I-15. I got to McCammon, took a quick potty-stop (yay, my hydration plan is working…) and took the I-15S on-ramp. At which point my life went to hell. In my head (and in my routing plan), I was expecting to average 80+ on I-15 as I traveled south gobbling up much-needed miles on the slab. How could I have been so wrong? In my warm-up rides and previous rallies, I have faced cross-winds, head-winds, combination winds, gusty winds, and the buffeting surprises that result from passing semis and motorhomes. But nothing in my experience prepared me for the evils that are the winds on I-15 in Idaho. What makes them special? They change direction on a whim! Just as I got settled into fighting the cross-wind from the west, I’d pass some invisible barrier and nearly get slammed over as it was suddenly coming from the other direction. I’d climb a hill against a headwind with the throttle pegged and my speedometer dropping, and suddenly find myself accelerating wildly while fighting to adjust for the new crosswind gust. I was facing 70 miles of this on a tiny little motorcycle and quite frankly, I was scared. I went into this ride with a bad right shoulder and it had started to give me grief on the USH-30 stint between Montpelier and McCammon. I had planned to take an Advil or two during my potty stop there but forgot. As I fought the wind on I-15, the shoulder screamed and threatened to give up completely. I pulled over at a rest stop, dropped four Advil, and did some serious soul-searching as to my next move. Had I made any mistakes to this point (e.g. off-target at the CP or missing bonuses) I might well have bailed. But as far as I knew, I was riding a perfect rally (based on my plan) and I wasn’t willing to let it go. So for better or worse, right or wrong, I made the decision to press on. I had to get back somehow, and the thought of begging Rich to drive the van up to rescue me at the rest stop was not appealing. The on-ramp from the rest stop was uphill and I found myself fighting for position with a 40-ft motorhome. I was in the fast lane and desperate to pass it when suddenly my bike gave up. The throttle was pegged and the bike started surging. I couldn’t get by, swearing didn’t help, so I bailed and dropped into the windstorm behind the RV. While I struggled to figure out what was wrong with my bike, a giant semi passed me too. I finally realized that my only problem was that I had missed top gear. Result: I redlined the motor and triggered the rev limiter (hence the loss of power and the surge). What a surprise! On that bike, I spend a lot of time searching for the non-existent 7th gear (it’s hard to get used to 10K on the tach). But this time, I missed high gear, topped out in 5th, hit the rev limiter, and as a result, lost confidence in the bike for the first time ever since the day I bought it. By the time I realized my mistake, I was stuck behind the semi, which creates a unique nasty buffeting wind eco-system in itself. I dropped back even farther to gain some stability, regain my confidence, and plot my next move. My opportunity came on a long uphill stretch where the wind had settled down a bit (relatively speaking), there was little traffic (competition for lane position), and both the truck and RV were suffering from a greater horsepower deficit than I (now that I had found top gear). I made my move and got past them both. Now that I’m safe and sound and heading for the next bonus points at Golden Spike and the Thiokol Rocket Garden, let’s reflect for a moment where my head was at: I had opted for a route that I knew no one else was on; I had endured 70 miles of torture on I-15; the temperature was well over 110; and I hadn’t gotten any bonus points in over 3 hours. Things were looking pretty grim. Imagine how pleased I was when after I had picked up the 1028 points for the Rocket Garden and was headed out to the middle of nowhere to Promontory, I passed several of my cohorts coming the other way! I was back on track! When I got to Golden Spike, there was Larry (of Kemmerer Karma fame). I answered the question (the final spike was set at 12:47pm, in case you care), and headed east toward the freeway with another 1697 points for my efforts. Things were looking up. Or so I thought. I had been extremely careful with my paperwork during the rally, especially after the Kemmerer reminder. Each time I completed all of the questions on a page, I’d remove that page from the carabiner binding and stuff it safely into my tank bag. After I left Golden Spike, I only had one page (and one bonus, for that matter) remaining. But as I headed east out of the park, with the wind coming from the south (my right side), I fell victim to a serious flaw in my tank bag/paperwork securing design. You see, my carabiners were on the left side with the stack of sheet protectors secure under my map flap. And all of my previous rally cross-wind had come from the left side, which had no impact. 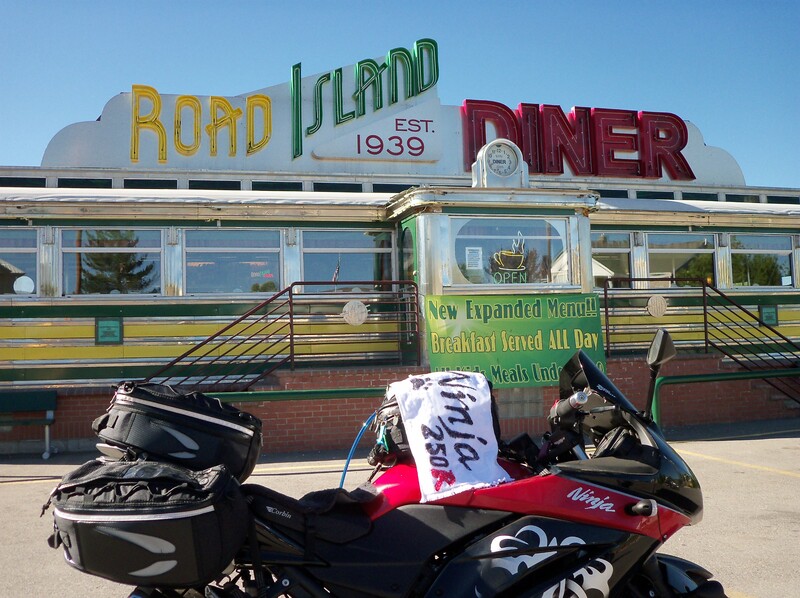 But on this leg, I found myself heading east with the wind blowing from the right side; the flap of my tank bag lifted, the plastic sheet protector got pulled out the other side, and <gasp> my last sheet of paperwork vanished – sucked right out of the sheet protector! I slammed on the brakes, made another of many illegal U-turns, and headed back west toward the Spike. Greater rallyists than I have gone searching for flying paperwork over the years, so I didn’t hold out much hope. But about 100 yds back up the road, I spied the missing sheet, stuck up against a thatch of weeds next to the road. I parked the bike and approached carefully, as though it were a stray dog and I might scare it away if I startled it. I managed to grab it (with enormous relief) and stuff it back in the sheet protector. At that point, I discovered the real issue: during one of my stops when I had removed completed sheets, I had managed to disconnect the middle carabiner from the tank bag. The result was a “bleb” in the attachment, not a fundamental design flaw. No matter, I wasn’t taking any chances and spent the next 30 miles lying with my chest on the tank bag to avoid any repeat performances. I only had one more bonus, then I could stuff all the paperwork away and relax. 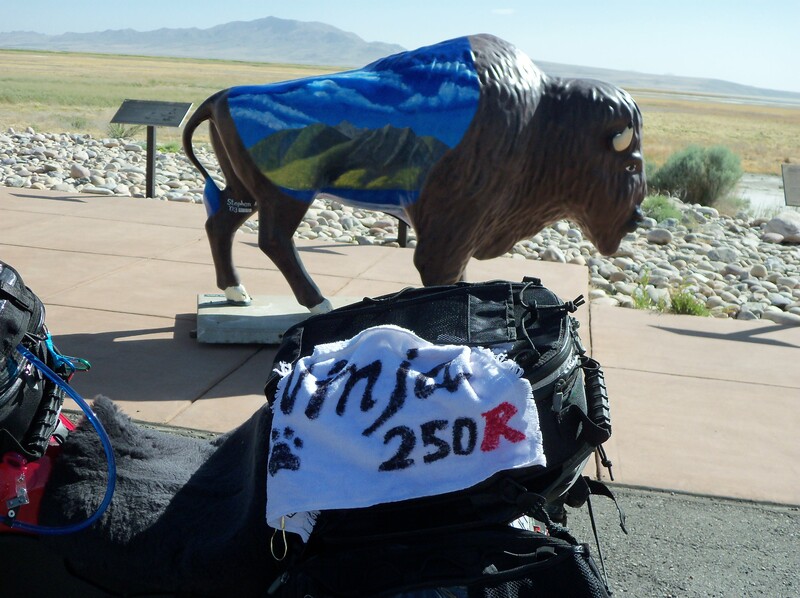 My last challenge before heading to the hotel was to bag a photo of the blue buffalo at the entrance to Antelope Island State Park. I’ve never been there so I didn’t know exactly where the “entrance” was, but I knew there was a multi-mile causeway out to the island. I made sure the round-trip length of the causeway was included in my routing plans, just in case the gate was on the island side, so that it wouldn’t come as a surprise and hose up my time. After my harrowing experience on I-15 and my near paperwork disaster outside Golden Spike, imagine my thrill at finding the blue buffalo on the mainland side of the causeway. Got the photo (2601 points) and headed back east for the cruise home. My GPS, which had expected an extra several miles of riding to the island, recalculated and provided a new projected arrival time at the Hotel/Finish of 6:10pm (due at 7pm). I double-checked my mileage (was already well over the 520 minimum required) and decided to cruise home in “no mistake” mode. I had never heard of Legacy Parkway, but I tucked away the information in my brain. The next sign I saw said “Legacy Parkway Exit – 55MPH – No Trucks”. No Trucks? YAY!!! I was so tired of trucks after my experience on I-15 that I would have done almost anything to avoid them. I had plenty of time to spare and I was in “no-mistake” mode so the speed limit was actually a relief. It didn’t matter that my GPS would fight me to avoid this road it didn’t even know existed because I knew exactly where I was headed. Legacy Parkway, here I come! The Ninjette and I rolled into the parking lot of the hotel at 6:18pm with 570 miles on the odometer and 42 minutes to spare. Rich was there to greet me with a Utah 1088 water bottle in his hand (one of the SWAG items, remember?). I already suspected what was in it – a bunch of ice, a bunch of Rose’s lime juice, and a bunch of vodka. But I wasn’t quite ready to partake – first I had to shed some gear, finish my scoring process and drink some more water. Review the bonus paperwork to confirm that all my entries are legible – answers to questions, check marks for photos, mileage/time for each bonus. Review the camera to be sure the photos are all there and my towel is visible. Not that it matters, of course, because I can’t fix it at this point, but just for my own peace of mind and no surprises at the awards banquet. And finally, take a sip of that ice cold vodka gimlet. When I headed back out to the bike to unload my luggage and GPS, I was shocked to discover that my right saddle bag was resting on the exhaust pipe. I disconnected it and peeled it away from the pipe (where it had melted and stuck) so I could assess the damage. At first glance, it didn’t appear too bad – a patchable hole in the bottom. And then I opened it and dumped out the contents on the grass. Holy cow, the devastation was astonishing. The heat turned the zipped-up bag into an oven and toasted nearly everything in its path. Remember back in Tremonton when I wondered about the trucker with the over-heated brakes? That wasn’t a trucker at all, it was ME! I was practically on fire and didn’t even know it. A few things survived somehow, notably the electric vest, Aerostich rain gloves, and glove and helmet liners – as it turns out, the expensive stuff! But my winter gloves were melted into an unrecognizable ball, my leather summer gloves looked like the hands of a CSI fire victim, and the nylon liner and inside straps had evaporated. And everything was infiltrated with an unbelievable stench. By far the scariest find was my handgun, which was stored safely in a nylon case with the clip and bullets separate in an outside zipper pocket. The bike had been parked in the shade for at least 30 minutes by this time, yet both the gun and the clip were still so hot that I could barely hold them in my bare hand. The bullets had gotten so hot the casings were discolored, as was the stainless-steel barrel of the gun. Wow, that could have gone very differently. I guess I literally dodged a bullet..
After discarding the ruined items and breathing a sigh of relief, it was time for a quick shower, dinner in the restaurant, then over to the bar for the post-rally story-telling. Little did I know (though I shouldn’t have been surprised) that he was yanking all of our chains. I had a drink or two, shared a story or two (including the whole ‘almost caught fire’ thing), then retired for the evening, confident in the knowledge that unless someone had somehow made it to Jackson, I was probably going to finish in a multi-way tie for 1st Place. But as you’ll see, pride definitely goeth before the fall. This entry was posted on Saturday, October 20th, 2012 at 1:49 pm and is filed under Endurance Rallies. You can follow any responses to this entry through the RSS 2.0 feed. You can leave a response, or trackback from your own site.